Looking into your hamster cage and finding that your furry friend got loose can be frightening, especially if you also have cats or dogs. Don’t panic. Instead, use a calm, step-by-step approach to secure the surroundings. You can do several things to keep your hamster safe while you track him down. You don’t want your dog or cat to find your runaway hamster before you do. Quickly round up other household pets, and put them in a secure location. Kennel your dogs, and put your cats in a small room that you can quickly sweep for your hamster, such as a bathroom or laundry room. Make sure your other animals have food, water and other necessities. If you have mousetraps, rat poison or any substances out that could hurt your hamster, remove them immediately. If there are open windows, doors or other openings that could allow your hamster to get outside, close them. Lower toilet lids. And until your hammie is found, tell everyone in the house to be careful where they step and sit. Prop open the door to your hamster’s cage and fill it with his favorite foods, especially ones that are aromatic, like peanut butter. This in itself might draw your hamster back, so frequently check the cage while you are searching elsewhere. Also look under bedding in case he’s taking a nap after his escape. Get a flashlight and go through your house room by room. Check closets, along baseboards and under furniture. Also look behind the furniture the hamster cage sits on, as hammies sometimes become stuck shimmying down a wall. After you secure a room, close it off. 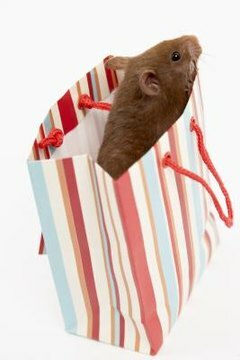 Put a towel along the bottom of the door to keep your hamster from slipping in unnoticed. If your hamster got loose during the day, he might be curled up and sleeping somewhere, like in a dark corner. If it's nighttime, he's more likely to be active and moving about. Turn off all noise-producing appliances and electronics and listen closely for him skittering about. Also, place small dishes of peanut butter in different parts of your house to lure your hamster out of hiding. Once you find your hamster, capture him by gently tossing a lightweight towel over him. This will stop him and hold him without hurting him. He is likely to be jittery and scared, so put him back in his house and let him get settled in. Once he calms down, check him for injuries, and make sure he has plenty of food and water. Double-check the locking mechanisms on his cage, and give it a good once-over to make sure it is tightly secured against future escapes.